Complete program of papers has been posted. Advanced registration and abstract submission opened. The website of the 67th Annual Conference on Mass Spectrometry in English opened. 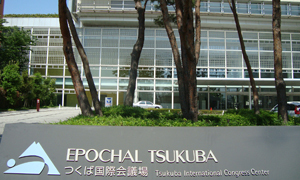 The conference is supported by Tsukuba Tourism and Convention Association and the City of Tsukuba. The Annual Conference on Mass Spectrometry, sponsored by the Mass Spectrometry Society of Japan since 1953, is one of the oldest annual mass spectrometry conferences in the world. The conference is open to colleagues in every country/region and papers that cover any aspect of mass spectrometry and allied topics may be presented. We heartily welcome all the domestic and overseas participants. Copyright © 2018-2019 The Mass Spectrometry Society of Japan All rights reserved.